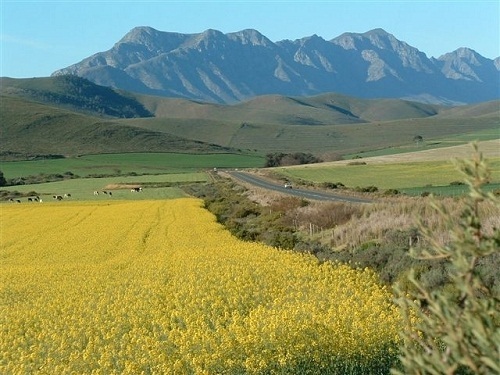 The Cape Country Meander, a touring route in the Overberg region of the Western Cape is gaining momentum as a family-friendly, value-for-money destination with an outdoor focus, and stretches along 100 km of the N2 just on the other side of the Sir Lowry's Hill Pass. Just over the mountain pass, an hour’s drive out of the city, lies inspiring landscapes of fynbos, canola fields, farming and wine lands. The area is hallmarked by dams, picturesque mountain passes and the gentle pace of slow living. The meander comprises eight towns: Grabouw/Elgin Valley, Botriver, Caledon, Riviersonderend, Tesselaarsdal, Greyton, Genadendal and Villiersdorp. Six mountain ranges, three magnificent mountain passes and seven dams, including the Theewaterskloof Dam, provide the natural backdrop to this attractive route. Explorers, adventure-seekers, traders, missionaries and farmers have all left their mark on the region, which is today a sought-after lifestyle option for those wanting to escape the city. "This region has been a best-kept secret for too long. Many people have visited one of our eight towns but have not seen the diversity, beauty and rich history of the region in its entirety." says Cape Country Meander's Lizette Kok. If the outdoors and adrenaline adventure appeals, then the Cape Country is your playground in close proximity to the city. A few of the activities on offer include fishing, biking, hiking, horse-riding, tractor-riding, sailing, birding, waterskiing, fruit-picking, clay-pigeon shooting,mountain biking, quad biking, kloofing, canoeing, 4x4-ing, river-barging and many more. Actually the Country Meander has much to offer independent travelers, action seekers, families and groups all within close proximity to Cape Town. Families with Kids will love the many attractions of the area, like the alpaca farm near Villiersdorp, the tractor museum in Villiersdorp, the hot springs and pools in Caledon, just to name a few of the attractions. A mere one-hour drive to the east of Cape Town, the beauty of the region will also have you coming back for more. Especially now in autumn with the apple harvest, the Cape Countryside will attract locals and foreigners alike with food festivals, harvest festivals and weekend markets in the area. In close proximity to Cape Town, The Cape Country Meander is an affordable travel option for Capetonians and other road trip explorers who are looking for short stay-cations and weekend getaways. Just over the mountain pass, an hour’s drive out of the city, lies inspiring landscapes of fynbos, canola fields, farming and wine lands. The area is hallmarked by dams, picturesque mountain passes and the gentle pace of slow living. From affordable and rustic to five star luxury and glamping; most Meander establishments are also owner-run, ensuring a more personal and authentic experience. With hallmark establishments like the extraordinary trailer hotel, Old Mac Daddy in Elgin, the stately Oak & Vigne in Greyton, the legendary Botrivier Hotel, kid-friendly Arolela Guest Farm in Caledon, the much-returned to Khomeesdrif camping site in Riviersonderend and Vredelust in Villiersdorp – the Cape Country Meander offers diverse choice. Various delis, farm stalls and restaurants pepper the route with hearty rural fare and a child-friendly attitude is assumed by most businesses in the area, with some actively specialising in spaces and activities for the little ones. Visiting in winter means that travellers can often take advantage of excellent rates and package deals. The Cape Country Meander maps and brochures are now available at tourism bureaus and select guest houses, hotels and eateries in Cape Town and the region, to assist travellers in maximising their experience of this part of the Overberg. Tourism is an important contributor to employment in this region, which was previously dominated by seasonal agricultural work. The intiative has been created by the Theewaterskloof Municipaility, in partnership with the regions’ tourism organisations and private sector contributors. Source: Rabbit in a Hat Communications.